This instrument is engraved with the arms of Paduanius of Forli in Italy, a physician for whom Erasmus Habermel made some 28 instruments between 1585 and 1586. Among the patients of Paduanius was Rudolf II, for whom Habermel would act as instrument maker in Prague. The engraving on this instrument is of outstanding quality. 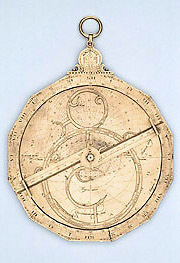 It includes a regular astrolabe on one side and a universal projection on the back, while some of the scales usually placed on the back are provided instead on one of the plates. A quadratum nauticum in the mater is beautifully executed, while the rete adopts a pattern of arresting elegance and originality. The rete in particular demonstrates that in the hands of a master craftsman, even the demanding discipline of geometrical projection leaves scope for imagination and creativity.